Given official English translation at last. 'Castle Strangerock' is a fine name for a fortification, particularly one that emerges from a foggy lake. I'm pleased to say that it's the place you'll be investigating in Nihon Falcom's Xanadu Next, a moderately old JRPG that's just been translated into English, been given a light buffing and released on Steam, on yer GOG and on the Humble Store. I had a fine old time with the original Ys when I played it for the first time a couple of years ago—apart from an end boss I found impossible to beat—so I'm interested to try some of Falcom's less well-known games. Xanadu Next is an "exploration-centric action RPG from Nihon Falcom," the Steam description tells me. 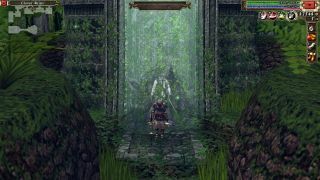 "A late entry in their immensely popular Dragon Slayer series and a spiritual follow-up to the late ‘80s cult classic Faxanadu, Xanadu Next puts players in the shoes of a gravely injured knight given a new lease on life through ancient magic who must now seek a legendary sword called 'Dragon Slayer' to ensure his survival". There's a 10% launch discount that's still active for the next five days, saving you just over a quid off the RRP.